Drinking chocolate milk after a long race helps replace fluids, and also provides macronutrients, vitamins and minerals to help aid recovery. Restocking your glycogen stores after racing a half marathon remains one of the best ways to speed recovery. What to consume, when and how much depends on how long and how hard you ran as well as how fit and efficient you are. Click here for the latest on Competitor. Clete McLeod, sports nutritionist and director of strength and conditioning for Southern Illinois University, provides more insight. What does the body need after running a half marathon? You want to replace the fuel you used, and that’s mainly carbohydrates—that’s primarily what the body uses as its fuel source at an event like that. The body can also use fat and protein, but, in terms of immediate recovery afterwards, we want to replace the carbs. We want to get a small amount of protein in the body as well, and that’s going to help the body recover from that long duration work. Is the 4:1 carbs to protein ratio a good standard for recovery? Yes, that’s a great standard. It’s backed by science. But, it seems like everywhere you turn, carbs have been the enemy and protein is what you’re supposed to be consuming, but really when you’re talking about an event where you’ve worked for a long duration, you don’t want to turn to an unnecessarily large amount of protein with the thought that if some of it is good, then a whole lot of it is going to be better. There’s an ideal ratio, and what it boils down to is you want a decent amount of carbohydrates to replace the fuel, and having a small amount of protein actually helps the body pick up that protein even better. Your ultimate goal would be finding a quality source of protein and having simple carbs available to help use that protein. What’s a quality source of protein? Flavored milks. Chocolate milk in particular is a great refueling source; it’s in the right ratios—the amino acid profile of the protein found in milk is of very high quality, and it has those simple sugars in there as well. Everybody tries to reinvent what the perfect sports beverage is and, as it turns out, the perfect sports beverage has been there all along. What about electrolytes and antioxidants? We get so caught up in the labeling, and I would really just encourage people to make sure they’re eating right all around. You should take post-event strategy for what it is: Does it have to be anything fancy afterwards? No. You’re just replacing the energy you’ve used. You need to put yourself in the position of repairing yourself and then you go back, hopefully, to a really sound diet that you have all the time. Are magnesium and calcium (found in milk) important after a race, too, or is it just the carbs and protein? When you consume chocolate milk, you’re replacing fluids, you’re getting the macronutrients you need and you’re also getting the vitamins and minerals present in milk. All together as a whole item of food, it stands alone by itself. Again, everybody is trying to reinvent and find this perfect combination of stuff, and they’re spending millions of dollars to reinvent milk. In the case of recovery, would high glycemic be preferable to a slow carb release? 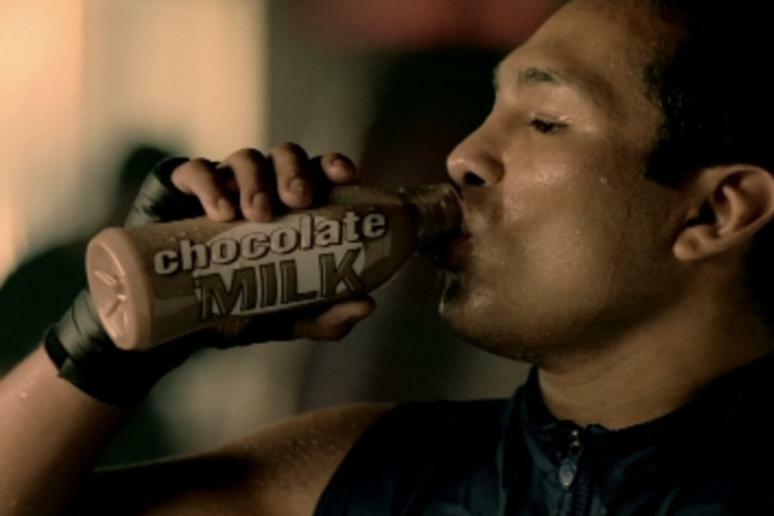 In terms of carbs and protein, chocolate milk has both fast-acting and slow-acting release. You have your simple sugars that sweeten the milk and that get into your blood very quickly. Then you have carbs that break down a little slower in the gut and are released a little slower. There’s a couple of different proteins in milk and one of them breaks down really quickly and another one breaks down a little slower. You get both, and this helps in the immediate recovery and the overall long-term recovery. How much should people drink? It’s one of those things where people over think it. It comes down to the size of the athlete and how efficient they are at recovering from the exercise they just did. Somebody that’s in really good shape and really efficient at running isn’t going to burn as many calories as somebody who is a recreational, occasional runner. It also depends on the duration of the event and how long it takes to finish it. You have to look at it on an individual basis and, once you take all of those factors into account, you can figure out what’s going to be best for you. Does the fat content of the recovery drink or food matter—in the case of milk, should it be low-fat, fat-free or full fat? There’s a lot of different thought on that right now; my initial response would be the absence of too much fat would help speed up the take up of the nutrients that are in milk. Ultimately, if calories are what we’re trying to replace, the fat content is going to help. Again, it’s an individual thing and about people’s preferences. For our athletes, we use low-fat chocolate milk—that seems easier for people to drink, and it’s easier for the body to pull in the carbs and protein. But, there are plenty of reasons why a higher fat content would be good as well. Should athletes refuel within 30 minutes after they finish the race? When people start breaking it down on that level, they’re not really focusing on the big picture. For your race event, you should have prepared for your nutrition before, during and after the event. Food doesn’t just magically get to the muscle and into your bloodstream just by consuming it. It takes a little bit of time once it’s in the gut to make it to the rest of the body. Be careful with what you’re eating leading up to the event and the night before, and maintain appropriate fluid levels during the event. As soon as you can tolerate it after the event, have a good choice like chocolate milk afterwards. It should be part of a much bigger plan and not just, hey, what should I have immediately after the race. I think that’s largely diet dependent. Some people may have diets very high in sodium and, if that’s the case, they don’t really need to worry about that. We try to come up with these great recommendations, but they really are dependent on the individual. What happens on a muscular level to the body after a half; why does an athlete need to refuel? The working muscles are using carbs and fat as the primary sources of fuel. When you’re looking at immediately following a long-term endurance event, your body is pretty starved for muscle glycogen. The body can only store so much of it and, ultimately, it depends on how efficient you are in converting fat to carbs for fuel use—that’s the whole point of running all the time. The people who are in really good shape and are really good runners metabolize fat much better than someone who doesn’t have that basis. Depending on your level of fitness, your body is going to be some degree of carb-depleted after a half: either very depleted if you aren’t a very fit runner, or moderately depleted if you’re a very fit runner. Sabrina Grotewold is a senior editor for Competitor. Christened the Kitchen MacGyver by her husband, she's determined to persuade people to eat their veggies.